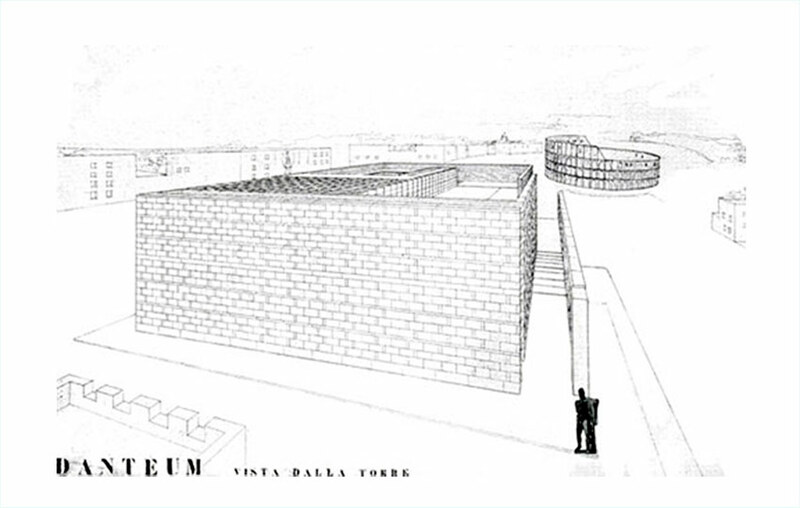 The Danteum is an unbuilt monument proposed by a young scholar of Dante, approved by the Benito Mussolini’s Fascist government, designed by the modernist architect Giuseppe Terragni. 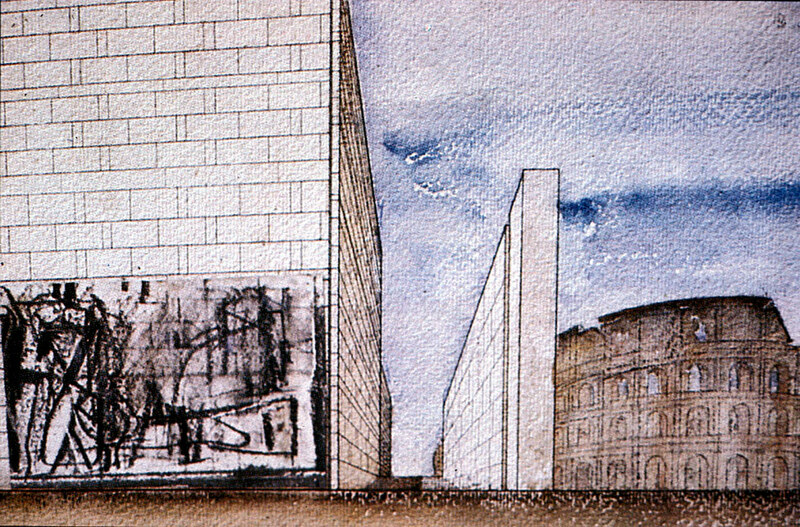 Nowadays, just some sketches on paper, scraps of an architectural model of the project and pieces of a project report (Relazione), written by Terragni remain. “The structure was meant to be built in Rome on the Via dell’Impero. The intention was to celebrate the famous Italian poet Dante, extol the virtues of a strong fascist state, that bases its foundations on the glory of imperial Rome. 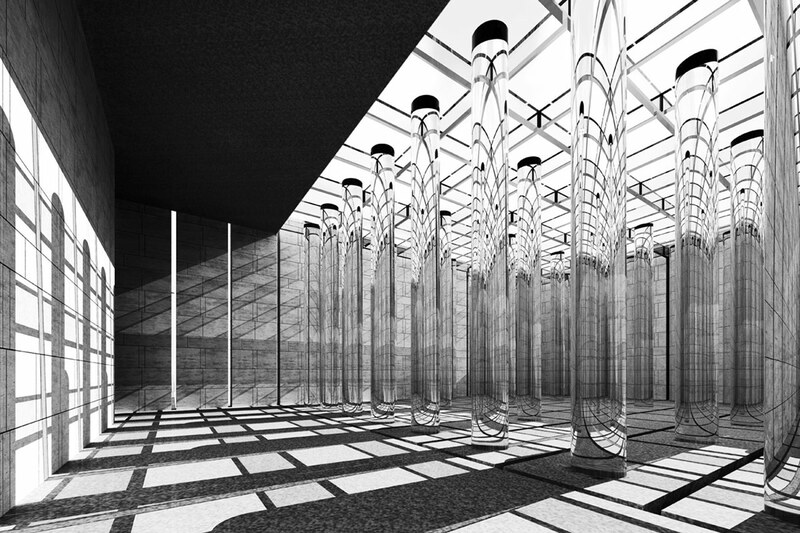 The residues of the project give us the unfulfilled dream of Terragni for a monument to Dante, in which the Divine Comedy was projected in an architectural scheme. 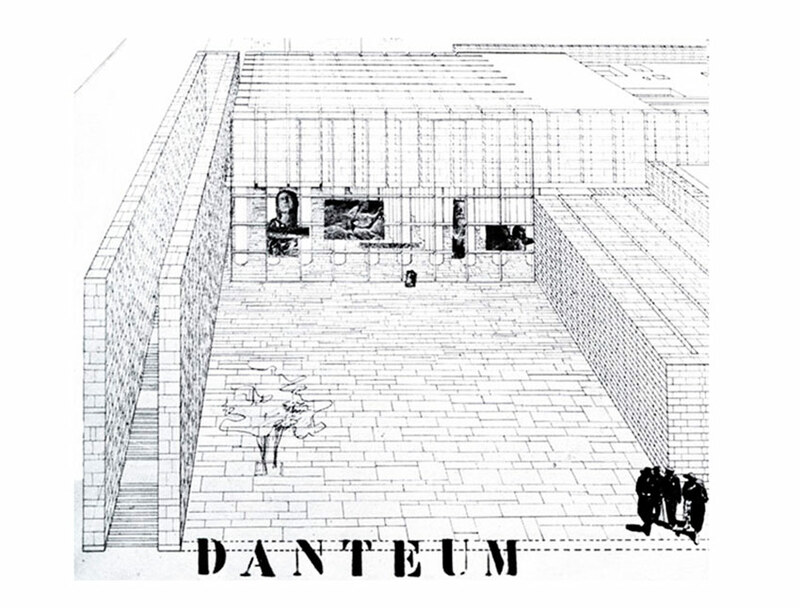 In 1938 Rino Valdameri, then director of the Brera Academy in Milan and president of the Società Dantesca Italiana (Italian Dante Society), had proposed to Mussolini Cabinet to build, in time for the Universal Exposition of Rome E.42, a Danteum to celebrate the great poet. The project was commissioned by Valdameri to Terragni and Pietro Lingeri and was supported by steel industrialist Milanese the count Alessandro Poss who had made available the sum of two million lire as a personal contribution to the project execution. Valdameri had also proposed a board of directors of twenty members to the nascent institution, made up of ministers, supporters and intellectuals, under the high supervision of the Head of government (Mussolini). The Valdameri himself had proposed some names for the board, including Giovanni Gentile and Ugo Ojetti. The November 10, 1938, at the Palazzo Venezia, the Valdameri and the designers present the project and they obtained the consent of the Duce. However, because of the political developments that led to the entrance into the war, the subsequent hearings to discuss the project, still they had been continuously postponed. At the very end the dream of the realization of the building dedicated to Dante Alighieri and the Divine Comedy, remained on paper. Regarding the project papers, we are left with a few copies of the boards of the panels with bas-reliefs, that had been photographed and entered in the drawings, and the project report of Giuseppe Terragni. Compositionally, the Danteum was conceived as an allegory of the Divine Comedy. It consists of a sequence of monumental spaces that parallel the narrator’s journey from the “dark wood” through hell, purgatory, and paradise. 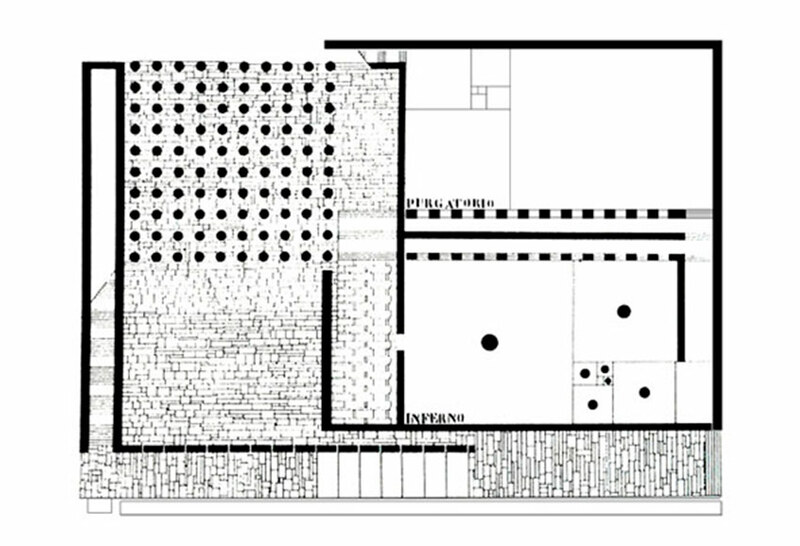 Rather than attempting to illustrate the narrative, however, Terragni focuses on the text’s form and rhyme structure, translating them into the language of carefully proportioned spaces and unadorned surfaces typical of Italian Rationalism. 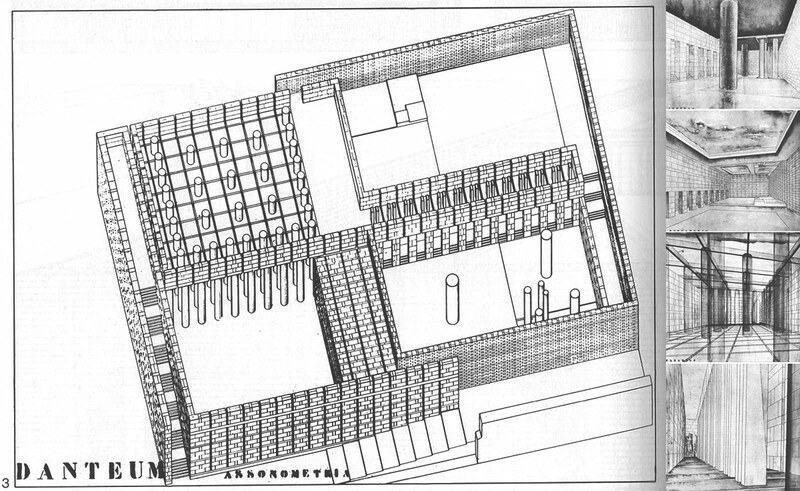 Cite this article: "The Danteum / Giuseppe Terragni," in ArchEyes, July 15, 2016, http://archeyes.com/danteum-giuseppe-terragni/.